Himalaya Turmeric 95 Review – Is This Product Safe To Use? Himalaya Turmeric 95 is said to promote blood circulation and immune activity especially around muscles and joints. Additionally, the product can stabilize lysosomal membranes leading to normal movement and flexibility. This supplement contains natural turmeric extract with up to 95 percent curcuminoids. It is vegan and non-GMO and doesn’t contain wheat, dairy, corn, or soy. Its working activity is said to provide antioxidants that support the normal growth of cells. Additionally, the antioxidants help reduce inflammations induced by exercises. What is Himalaya Turmeric 95? This is a completely additive-free product with strong antioxidant properties. It is said to contain strong ingredients that support the natural responses of the body to oxidative cell damage. Moreover, the supplement is claimed to support fast cellular growth and the natural cleansing process of the body. This supplement is a wide-spectrum herb that can supports a wide range of systems in the body. It comes in easy to swallow caplets that are easily absorbed into the blood stream. The product is gluten-free and doesn’t include artificial ingredients. Since its ingredients are all-natural, it is a safe product and anyone in your family can use it to enjoy its numerous benefits. What is the Company Behind Himalaya Turmeric 95? This product is manufactured by Himalaya Herbal Healthcare. The company is headquartered in Bangalore, India and has branches in more than 75 countries in the world. The company attributes its success to combining modern pharmaceutical technology with the traditional system of natural health. Besides this supplement, Himalaya Herbal Healthcare also manufactures other unique supplements to promote the wellbeing of people globally. According to the company, this supplement is developed and evaluated following the most recent scientific standards. For maximum results, the company recommends taking one capsule every day after meals. What are the Ingredients Used to Make Himalaya Turmeric 95? Himalaya Turmeric 95 Review-Does it Actually Work? This supplement contains active ingredients believed to provide the advertised benefits. The ingredients are powerful and are able to promote blood circulation around the muscles and joints. Its working activity is believed to bring about a stabilizing effect especially near the lysosomal membrane to promote flexibility and normal movement. The antioxidants available in this product can support normal cell growth and participate in the reduction of inflammation. What are the Advantages of Himalaya Turmeric 95? 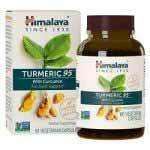 What are the Disadvantages of Himalaya Turmeric 95? A bottle of this supplement contains 60 capsules, which can last you for two months. One thing about these capsules is that they are easy to swallow. Moreover, they allow for easy absorption into your bloodstream. Once in the bloodstream, the product can support cellular growth and as well as the natural response of your body to oxidative cell damage. The manufacturer seems to be legit and dedicated to providing a wide-range of high-quality supplements to users. The recommended dosage is one capsule every day after meals. Users are warned against keeping the product near the reach of children. Moreover, users are encouraged to store the supplement away from direct sunlight. Before settling for this supplement, shop around to see what the market has to offer. This is mainly because this product might contain some extra ingredients that might be harmful to your health. Remember that the effectiveness and working activity of this supplement aren’t FDA certified.